It is so easy to make and so quick. this would go great for family and friend occasions. 1 roll of garlic bread (we get ours from woolworths or if you can make your own that works too. 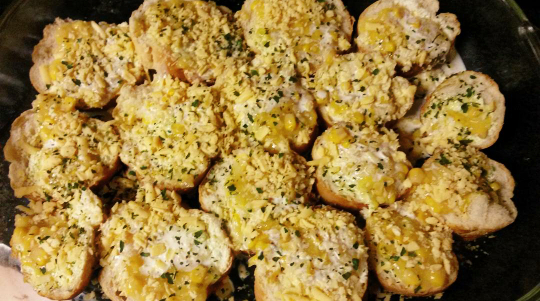 If you have made your garlic bread roll or have purchased it, make sure they're in slices. Grease or spray a non stick spray on a pyrex dish (baking tray). 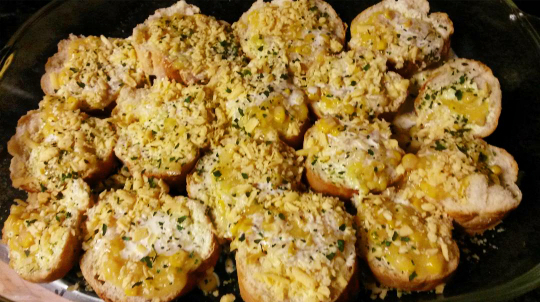 Layer your garlic bread in the dish. Add a spoon full or more of the cream style corn on each slice just to cover the top. Top with a lot of both cheeses. Place in a hot oven and grill till everything has melted together and the bread is a bit toasted. Serve hot, you can cover with some foil to keep it warm especially if you're eating outside or you're making a large serving. I'm craving this with ketchup lol. Good recipe ! These look delicious. I am expecting guests in a few weeks and am looking for new recipes. Thanks for sharing. You're welcome:) It also goes well with anything grilled if you're not doing a bbq, especially steak. Something that the kids would really love! Looks so delicious! I will definitely try this. I'm sure my kids and myself will love this. Easy and quick... just what I love. And its great that it compliments many dishes - I love experimenting with food. Me too, someone who suggested to add fresh cream, a spoonful to each slice, but I personally didn't like it so much with the fresh cream so I didn't skipped that part when sharing the recipe. This will be great for when I have guest over for dinner. I will be making these insha Allah. I have never tried cream style corn. Sounds interesting. I love garlic bread with cheese though.